Dr. Paul Phrampus, WISER Director, and John O'Donnell, CRNA, MSN, DrPH, Associate Director, Nursing Programs at WISER, recently authored a chapter on "Debriefing Using a Structured and Supported Approach" in The Comprehensive Textbook of Healthcare Simulation. The chapter they penned focuses on the Development of the Structured and Supported Debriefing Model, the GAS (Gather Analyze Summarize) Tool, The Theoretical Foundation of the Structured and Supported Debriefing Model and, the different phases of the GAS model. The book was edited by Drs. Adam Levine, Samuel Demaria Jr., Andrew Schwartz and Alam Sim. 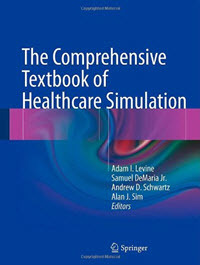 This book serves as a resource for individuals involved in healthcare simulation and shows how simulation assists with training, assessment, debriefing, and patient safety.